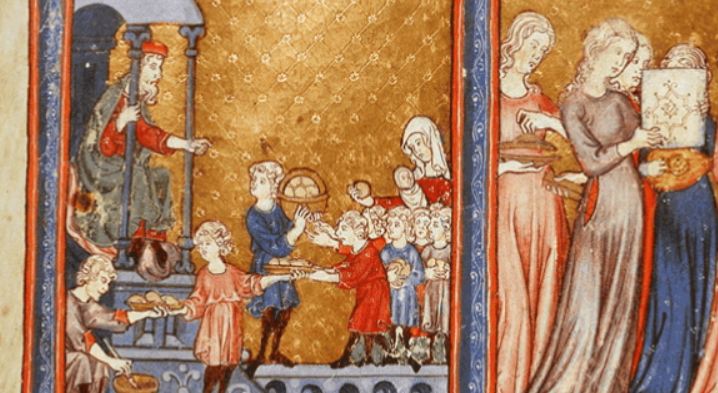 The written recipes for almodrote that have survived from fourteenth- and fifteenth-century Spain instruct cooks to vigorously pound shredded cured cheese and a good amount of raw garlic into a paste. 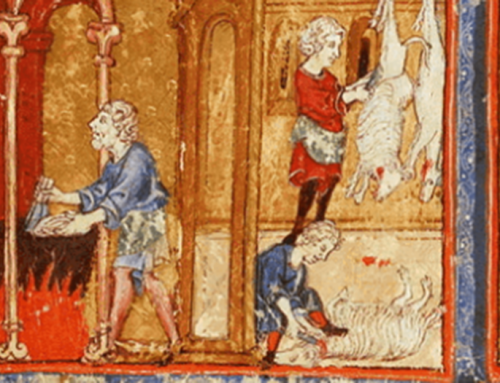 The fourteenth-century Catalan Llibre de Sent Soví emphasizes that, when making almodrote or “almadroc,” the pounding motions need not be circular but vertical in order to ensure that the paste will bind. Juan Vallés, who lived in the first half of the sixteenth century, was the author a major compendium of household recipes and remedies called Regalo de la vida humana or Life’s Indulgences. 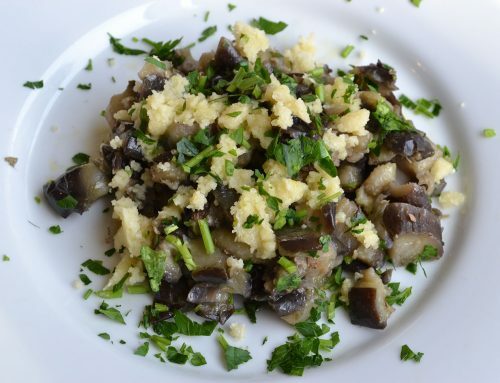 Vallés provides a classic recipe for almodrote and another one for eggplant with almodrote. Briefly boiling the eggplant before sautéing it with olive oil, as he suggests, helps avoid having the eggplant soak up too much oil. The pungent mixture of aged cheese and garlic may seem unusual, but it is delicious and in some ways similar to other such pastes as the Italian pesto, which adds nuts like pignoli or pinenuts and herbs like basil, or the Catalan picada, which relies on pounded nuts and tomatoes and dried chilies. All of them are worthy of entering your cooking repertoire. Almodrote is a mainstay in the diet of the Sephardim in the diaspora and lives on many slightly different versions. Eggplant originated in Asia and was introduced in Spain, where it thrived, by the Muslims. 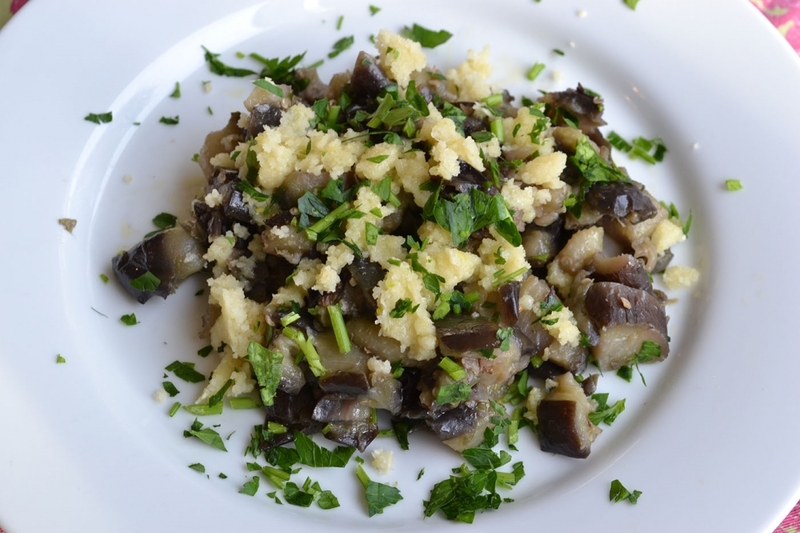 Eggplant was stereotypically identified as quintessential Jewish food, although it was consumed by the larger population as well. Ethnic profiling of Jews (as well as Muslims) often included references to the Jewish preferences for eggplant in, for example, wedding banquets. y las llamaba por nombre la comida de almodrote. and she called them by their name almodrote dish. The cantiga has been studied and published in Elena Romero’s Coplas sefardíes: Primera selección (Córdoba: Ediciones El Almendro, 1988). It can be viewed in full at this link (without English translation). Today, the almodrote recipes found in Sephardic kitchens typically include feta cheese or a mix of feta and a firmer cheese like gruyere and eggs, either boiled or raw, to thicken the sauce. They may also eliminate the garlic altogether and roast rather than boil the eggplant. The resulting dish is cooked in the oven and more like a homogeneous casserole or gratin of eggplant, egg and cheese than a relish that accompanies pan-fried eggplant. 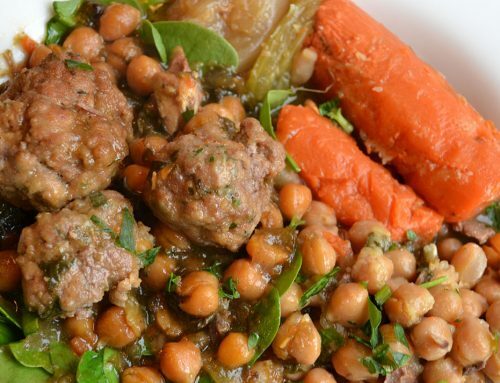 For a Moroccan recipe you can visit this blog. The New York Times published a recipe of a Turkish version, available here. 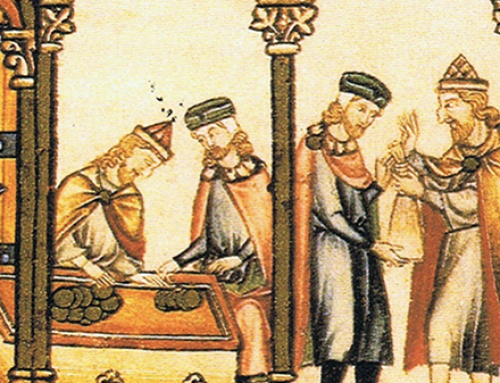 Sephardic Studies at the University of Washington – Explore more Sephardic history and culture through articles and digital artifacts at the Stroum Center’s Sephardic Studies Program page. JewishStudiesHUB – Explore our innovative blog page with fresh views on Jewish topics by UW faculty and students. You can also access video clips and view new media projects. Explore Sephardic history and culture more at the Stroum Center’s Sephardic Studies Program page. 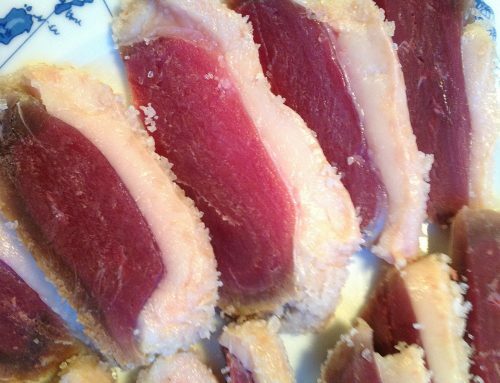 Learn how to make almodrote. Professor Gómez-Bravo received her Ph.D. from the University of California at Berkeley. Her main research areas are medieval and early modern Spanish literature, rhetoric and poetics, and theories of ethnic and gender difference. 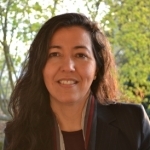 Professor Gómez-Bravo has received grants and fellowships from the following sources: National Endowment for the Humanities, American Philosophical Society, Program for Cultural Cooperation between Spain and US Universities, Purdue University, and UC Berkeley. Her work has appeared in Rhetorica, Hispanic Review, Romance Philology, Bulletin of Hispanic Studies, Hispania and La Corónica, among others.